After years of failed efforts to reform Washington's unusual condo liability law, there is bipartisan support in Olympia this year for a bill that could encourage developers to build more condos. As the Puget Sound region attempts to build its way out of the housing crisis, it’s fallen woefully short on one critical aspect: affordable homeownership. Apartments for rent are springing up all over Seattle and parts of the Eastside, and some outlying communities have added tracts of expensive new single-family homes, often far from jobs. But people who just want to be able to buy a small, reasonably priced condo are mostly out of luck — local developers all-but-abandoned condo construction in the past decade even as demand soared. That pushed prices for the typical condo in Seattle and the Eastside to nearly half a million dollars — up 117 percent in six years. In the last six months, condo prices have cooled a bit and developers have slowly started to build condos again, but prices remain near record levels, while inventory and housing production remain historically low — with the busy spring home-shopping season about to get underway. Why aren’t more condos getting built? 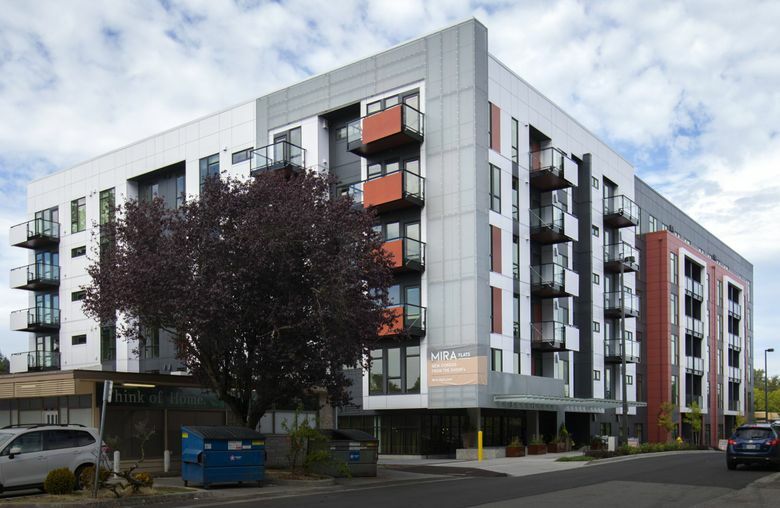 A big part of the reason, any developer will tell you, is Washington state’s unusual condo liability law, which makes it easy for condo owners to sue builders over even minor defects in construction. The insurance costs and legal risks are high enough that most developers don’t bother with condos, and the few that do have to tack those added costs onto their new units, making them even more unaffordable. Now, after years of stalled efforts at condo reform, there is momentum in Olympia to change the law in hopes of spurring more condo construction. A bill that would make it harder, but not impossible, for condo owners to sue developers has bipartisan support and even the blessing of trial lawyer groups that had helped scuttle past condo-reform bills. The legislation, from state Sen. Jamie Pederson, D-Seattle, and co-sponsored by 17 other lawmakers, passed unanimously out of the Senate on Monday, and faces little vocal opposition as it heads next to the House. Pedersen wanted to come up with a compromise that allowed condo owners to still bring lawsuits when truly needed, while protecting developers from onerous legal proceedings. Lawmakers from around the state have been pressing housing issues more this session, as a problem once viewed as affecting only the Seattle area has spread statewide. Housing prices continue to soar far faster than incomes from Vancouver to Bellingham to Spokane, where lower pay means residents typically spend a similar share of income on housing as people in Seattle do. Under Washington’s current condo law, condo owners can sue builders more easily than in most states — it allows suits for several years after a building is completed and uses a broad definition of what a “defect” is. Pederson’s bill, SB 5334, does a few things: First, it reduces the personal liability of condo association officers by granting them the same immunity given to board members of nonprofits and companies; under current law, those condo board members could be forced to pay to repair defects in their building if they do not sue the builders that cause them. As it stands now, those homeowners’ association (HOA) members often sue proactively to defend themselves against that risk. Second, it raises the bar for what condo owners can sue over — instead of the building having to comply with “all laws,” a lawsuit will need to prove the construction team violated building codes in the state. The condo owner would have to prove not just that the defect exists but that it would cause harm, like an unreasonable safety risk. Another bill also moving toward a vote on the full Senate floor would exempt condo projects under seven units from some of the legal risks, an attempt to spur construction of smaller projects. A third bill — from Senn, which passed a House committee on Friday — would require condo owners to secure a majority vote of the HOA before they could sue. It’s unlikely that the changes would suddenly unleash a flood of new condos — there are other reasons they don’t get built. Apartment buildings continue to be favored by most developers as solid moneymakers, while fears of another condo bubble — like the one a decade ago, when the market crashed and empty condos had to be converted to apartments — still linger. Jan Himebaugh, government affairs director at the Building Industry Association of Washington, said if the bills pass it will take time for the real estate and insurance markets to react, but eventually it could be a significant step toward encouraging more condo development. “I do think it’ll make a difference,” Himebaugh said. Condo prices have soared in recent years but remain the most affordable homeownership option. In Seattle, the median condo costs $470,000 while the typical single-family house sells for $757,000; and on the Eastside, condos are $440,000 while houses are $910,000. Demand for condos has outstripped houses: Since the market bottomed out in 2012, condo prices across King County have soared 119 percent, compared with a 94 percent increase for single-family homes. 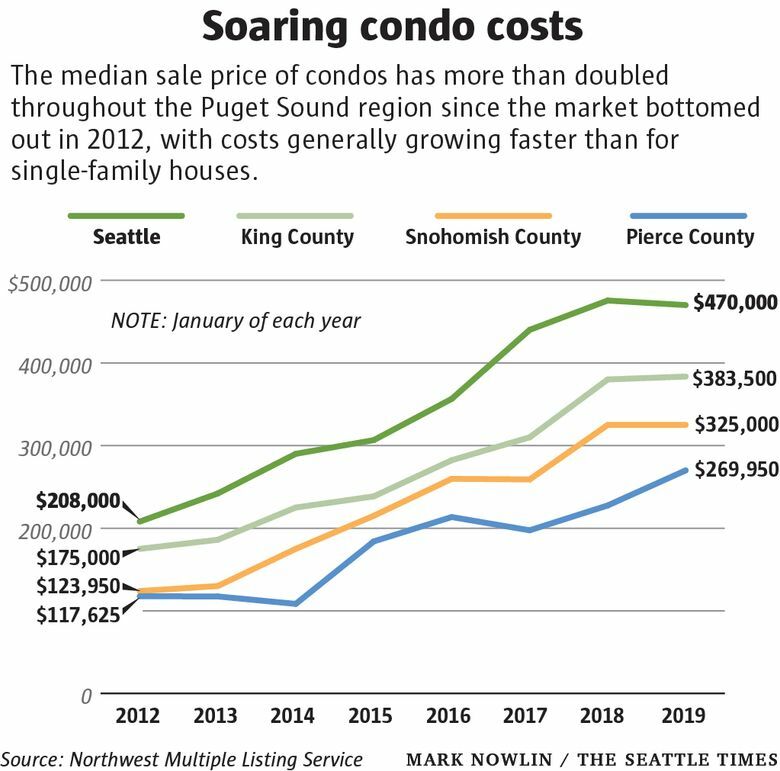 In that same span, condo prices skyrocketed 162 percent in Snohomish County and 130 percent in Pierce County. More recently, the local condo market — like the rest of the housing market — has cooled. In the past year, the number of condos sitting unsold has tripled while prices have stayed flat. But the recent cool-down hasn’t suddenly solved the condo conundrum. The number of condos for sale across King County, while up recently, is still at about half the levels seen on average over the last two decades. And prices, even with a small drop recently, remain 13 percent above the inflation-adjusted, bubble peak from 2007. Even before condo reform gained momentum, developers had started slowly shifting back toward condos, since apartment rents had stopped growing amid the flood of new rental units here, making condo construction look more attractive by comparison. About 6,000 condo units are in the pipeline in Seattle and Bellevue for the next several years, after just 2,000 opened in the two cities all decade. But not all of those will get built, and even if they do, the housing production remains historically low: About 9,000 condos opened a decade ago in those two cities, even though their combined population was nearly 20 percent lower than it is today. There are also signs that the condo cool-down could be easing heading into the busy spring buyer season. Pending condo sales in King County grew in January, on a year-over-year basis, for the first time since February 2018, back when the market was still the hottest in the country. The bills could also reduce developers’ insurance costs, which, in theory, could reduce homeownership prices, though it remains to be seen if builders will actually pass those savings onto buyers. “There are so many developers that would want to come back into the market if it was a more developer-friendly space,” Clibborn said.